What to look for when buying dog bike trailers? 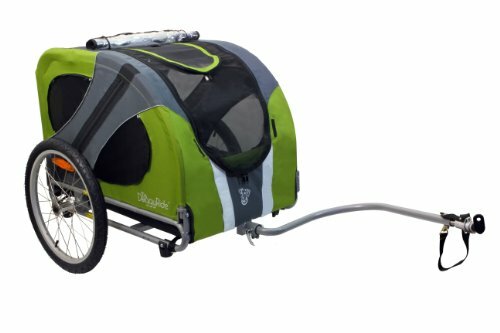 Where can I buy a dog bike trailer? How to train your dog to ride in a bike trailer? One of the greatest benefits of having a dog is the motivation that comes with it; the motivation to go outside, exercise and explore. Few loving dog owners can resist those big and loving eyes staring up at you, and before you know it; just as much as your dog wants to be with you – you start wanting to be with your dog! You want to take him with you everywhere, including on summer activities and vacations. A great activity to enjoy as a family is biking, but is it a good idea to bring your dog on a bike trip? What happens if he gets tired? This potential issue can easily be resolved with a bicycle trailer for dogs, as it allows you to pop the dog in the trailer, should he need a rest, and continue down the road of adventure! A dog bike trailer is not only great for a temporary rest but could also be an investment for senior dogs or injured fur buddies, as it would allow them to enjoy time out with the family, even if they can no longer keep up physically. The possibilities are endless with a high-quality pet trailer for bikes, thanks to their versatility and numerous fields of usage. Bring it with you so that your dog can take a quick rest on longer trips, or let your small, senior dogs or injured dogs come along for the ride! You can even use it for a toddler, or groceries! Or hey, why not a small dog, a toddler, AND groceries? This is a funky bike trailer dogs will love to roll around in! Its maximum weight limit is 40 pounds, and while it may not be specifically made for dog transport, it makes an excellent bike accessory for bike adventures with small- to medium pet dogs. Made from durable rubber and steel; it comes equipped with a weather shield and a bug screen, a toddler safety harness and plenty of space for a furry family member to rest comfortably as well as space for their luggage such as dog bowls, leads and their fancy dog collars. The sturdy construction makes it easy to pull along, and it attaches to most bike models with the included hitch. As an extra plus, this product folds up nicely to fit in small spaces during transport, making this a reliable option for a bike trailer for dogs. Comes in green, red and blue. Why We Liked It – The InStep Sync is made to safely transport a child, which speaks for it being a high-quality choice also for a bicycle dog carrier. Related: The Best Slings for Dogs. With a soft and padded interior (all removable for easy washing), these charming pet bike accessories have everything to make them great bike trailers for dogs. The product holds weight up to 50 lbs, and comes equipped with a practical doggy door in the back, which allows the dog to jump in by himself instead of having to be lifted in. 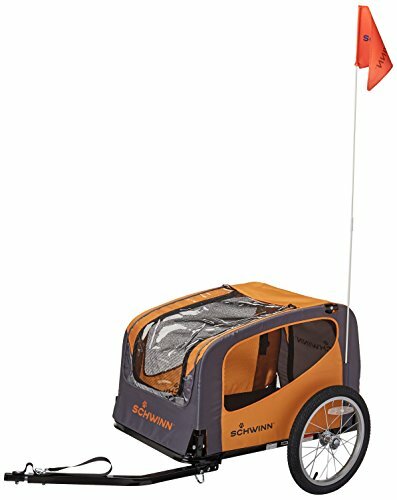 There is a storage pocket for whatever items you need to bring with you in your Schwinn Rascal pet trailer, and an attached leash to safely secure your dog inside this dog carriage for bike enthusiasts. Take your four-legged friend on an adventure, without having to worry about him jumping out along the way. 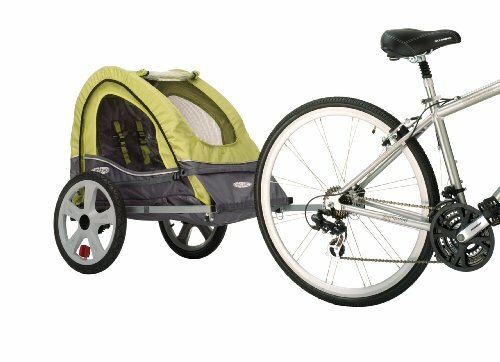 Easy assemble perfect for a family on the go, and the Schwinn Rascal pet trailer folds up equally easy for hassle-free storage. 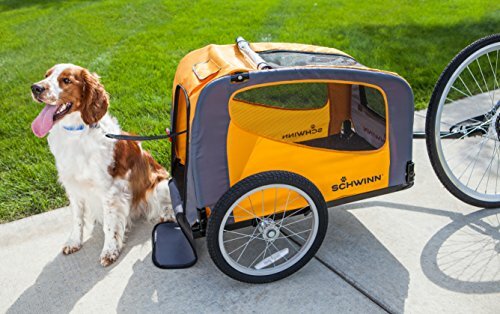 Why We Liked It – This Schwinn Rascal dog bike carrier is a product made with man’s best friend in mind, and it is great to see features like the doggie door and the leash to prevent the dog from jumping out. dog bike trailer onto most adult bikes and roll off into the sunset with your four-legged friend! 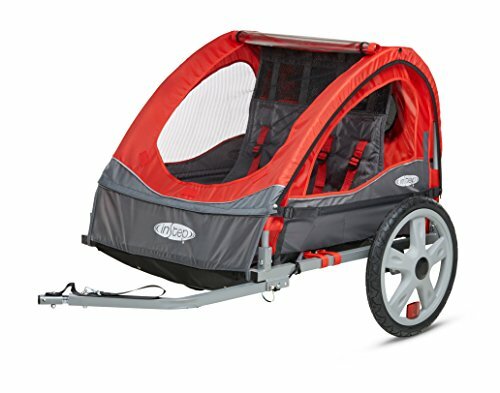 As a fun and somewhat unexpected addition – this bike pet trailer can be converted to a stroller jogger with an additional kit (sold separately), and it can be used as dog crates for overnight escapades. Why We Liked It – Finding pet bike trailers for large dogs isn’t always easy, as many products are made for small- and medium pet dogs. These dog strollers can carry up to 110 lbs, which basically mean you can put a small Great Dane in there, if you want! Don’t forget to bring food for your Great Dane! aluminum pet bicycle trailer for storing water, leash and personal items, or how about a snack and some kibble so that you can stay out all day? aluminum pet bicycle trailer like a lower design and a big door for the dog to step in through caters very well to older and injured dogs, and it is nice to see a company that takes these animals into consideration when constructing a dog trailer for bike rides. A small furry bestie does not need to ride around in a portable mansion (or do they? ), and they might often feel safer if transported in a cozy smaller space. Small dog bicycle trailers, such as this DoggyRide mini dog bike trailer, are excellent options for devoted pet parents with dogs weighing up to 55 lbs and measuring up to 15-inch shoulder height, since they are easy to pull around with most bikes and takes up almost no space when stored. The reason to why a miniature dog might need a small dog bike trailer is not necessarily that they could not keep up, but it might not be safe for a small dog to trail along a bike, especially not in trafficked areas. This DoggyRide mini dog bike trailer is made with resistant nylon and UV-resistant mesh, and with screens that roll up and down to cover the windows, this practical dog bike carrier is ready to be used in most weather conditions. It seems excessive for the owner of a small dog to roll around with a bicycle dog trailer made to fit an extra-large dog, especially when all that extra space might just make your dog uncomfortable. This product caters to the need of small-dog owners! 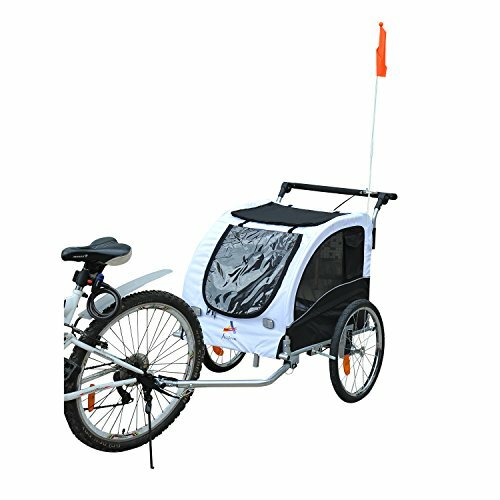 pet dog bike trailer has two settings; it can either be fixed to better suit jogging, or swivel for a comfortable stroll in the park. The handlebar adjusts to different heights, it has three separate entrances to easily get your dog in and out and it is made from light-weight material, making this hybrid dog bike stroller fun and simple to use. Assembles without tools. pet dog bike trailer does not! 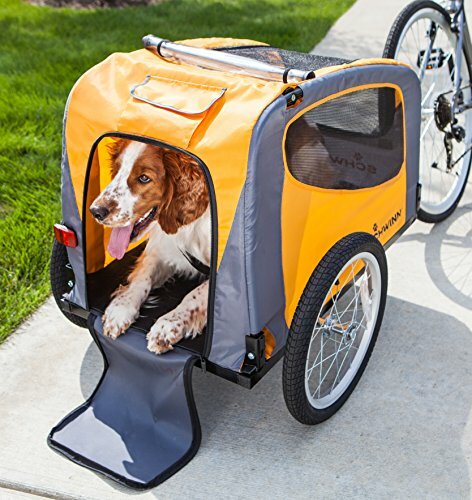 An all-in-one pet bike trailer for dogs, which can also be used when going for a morning run. This is a stroller jogger you don’t want to miss out on. When looking to purchase a pet trailer for bicycle rides, one made for children tends to work just as well! 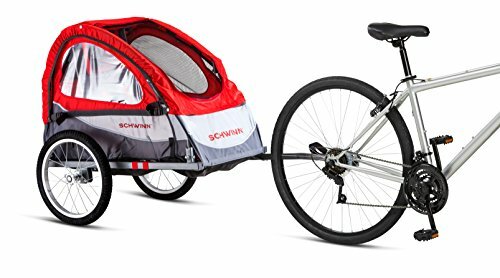 The Schwinn Trailblazer is suited for riders, human or canine, weighing up to 40 lbs, and works well for a family who might sometimes want to use it for a child, and other times for a dog. Bicycle trailers for dogs; those made especially for them, are usually not suitable and/or approved for children to ride in, but dogs can ride safely in one made for kids. This one attaches easily to most bikes with a convenient one-time installation, and after that you simply hook it on and you are ready to go! For a dog to be completely comfortable (since this is not made directly for them), you might need to add a cushion to cover the bottom, so that they can sit or lie down on a stable surface. Why We Liked It – It might seem strange why someone would buy a trailer for a child instead of just going straight to the section of dog trailers for bikes, but one designed for human children have their benefits! What if you wish to transport your child sometimes? Or your child and small dog together? A child shouldn’t ride in a pet dog bike trailer, so it is smarter to get one made for children rather than having to get two. This is a spacious and luxurious ride for two! It can fit and carry two riders, human or canine, of 40 lbs each, making one of these ideal either as large dog bike trailers, a trailer for two smaller dogs (under condition that they get along well enough to travel together), or – who knows – for a child and a small dog! Everyone in the family should be able to come along for a planned outing, and with this product you are in for a hassle-free experience. 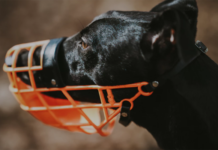 It assembles easily, has 5-point safety harnesses for human riders, big mesh windows for a good view and plenty of space for a dog to tag along on a ride around town, on a camping trip or for a faster arrival at the dog park. While made for children, it can easily be converted to a sturdy and reliable bike sidecar for dogs. Why We Liked It – Many bike pet trailers are too cramped and claustrophobic for a bigger dog, which makes pet owners opt for not getting one. This product is originally made to fit two children weighing a maximum of 40 lbs each, which means it can hold up to 80 lbs in total – perfect for a big furry fella! Get the space and the comfort, while also a light-weight bike dog carrier. Similar to the Aosome Elite II, this Choice Products bicycle cart for dogs can be used both as a handy stroller for walking or running with your dog, or it can be attached to a bike and taken on an exciting bike ride. 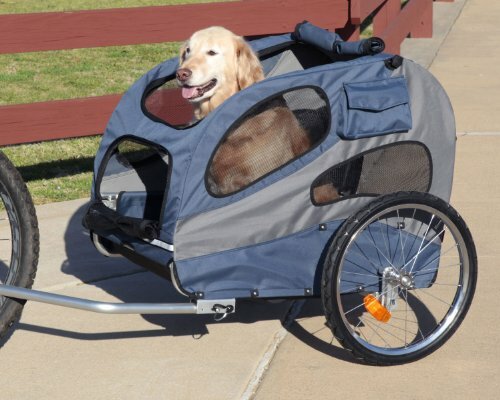 Regardless of what you choose to use it for, this sturdy stainless-steel bike buggy for dogs is a option which offers plenty of ventilation thanks to its mesh windows, so that your dog can experience a comfortable breeze as he rides along with you. It has great safety features in form of a well-developed harness attachment inside the Choice Products pet bicycle trailer, and there is even a break system to make sure the ride goes as smoothly as possible. 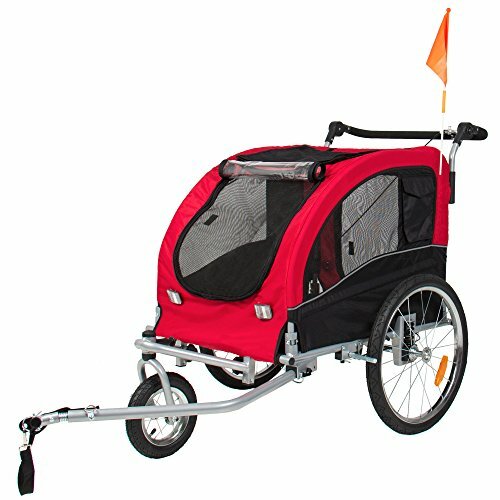 The maximum capacity is 88 lbs, making these bike carts for dogs suitable also for larger friends. It is 2-in-1, so much more than just a pet dog bike trailer or a stroller, so what do you call a hybrid like this? 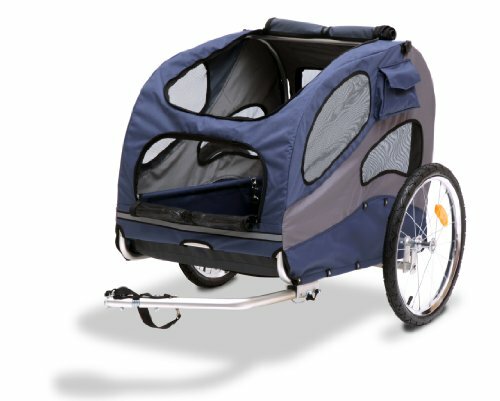 How about a pet bike trailer stroller? Yes, that could be it! This transformer of a bike dog trailer does not shy away from a challenge! It is sturdy enough to carry a dog weighing up to 75 pounds. What is not to like? 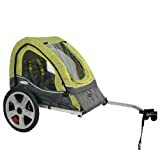 It is spacious, built out of sturdy materials with a stainless-steel frame, 16-inch quick-release wheels, a removable floor for easy cleaning and washing and an option to attach a dog leash for the dog to travel safely on the road. 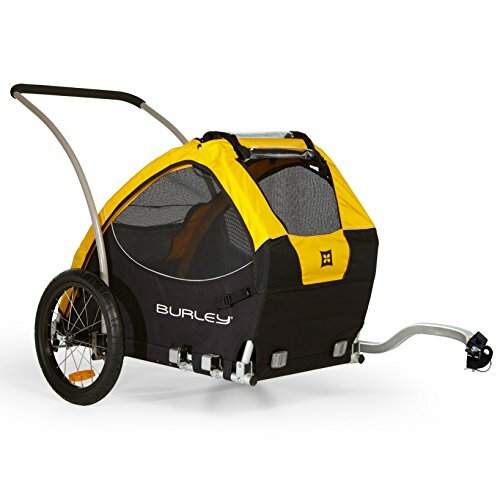 The Burley Tail Wagon is not just any dog wagon for bike loving owners to transport dogs in – it’s an experience all it itself, adaptable to all kinds of circumstances. 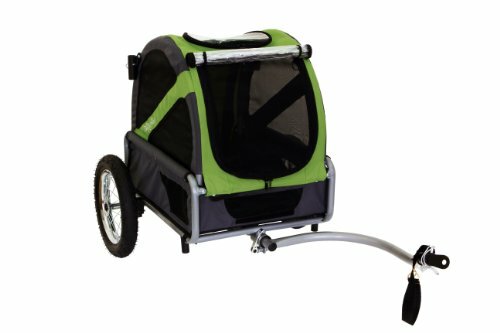 This dog cart for bike adventures can turn into a pet stroller with the additional 2-Wheel Stroller Kit (sold separately) or be converted to the ultimate winter excursion accessory if choosing to buy the We! Ski Kit. Few pet dog bike trailers are as versatile and as stylish looking as this gem right here. Why We Liked It – As it is easy to fall in love with this bike cart for dogs, chances are you will want to use it for more than just biking. The option to buy a kit for converting it into a pet stroller, as well as to a cart apt for winter conditions, makes this potentially the best dog bike trailer for a sporty and active family. 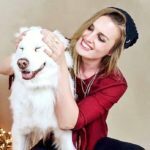 Committed pet owners turn to pet dog bike trailer reviews to get help with finding the perfect dog bicycle cart for their furry family members. It can seem like an overwhelming decision to make, since many products look- and function alike, and whatever product you choose must be reliable and sturdy enough to ensure safe bike trips for your beloved dog. There are a few things to know about the purchase, and a few things to look for, which can help make the experience a lot less stressful. Using a dog buggy for bike rides has many benefits. If planning a longer trip, such as a family bike vacation, it is unrealistic to think that a dog will be able to run beside you the whole time. He might love to run, but there will be times when he needs his rest, or you won’t be doing your dog nor yourselves any favors. Investing in a bike trailer for pets means that you won’t have to stop just because your dog is tired, and he (or she) can rest comfortably while you continue your journey. Older dogs also tend to appreciate some well-planned pet trailer bike adventures! They might no longer be able to walk far due to joint pain and general body ache, and with one of these they can come long anyway, without having to be in pain. 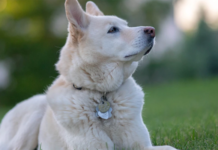 It can be used for something so simple as transporting your elderly dog to the dog park, so that he or she can take a little stroll at his/her own pace. Same goes for temporarily injured dogs, who might have restricted movability, but still need their time out in the sun. A pet dog bike trailer is not meant to be a substitute for walking your dog, but instead an aid for when your senior dog might not be able to walk, either because of old age, injury or exhaustion. There are quite a few different models to choose from on the market today; some with two wheels, others with three. Some models are dog stroller bike trailer combinations, where a few small adjustments can change it from a bike trailer to a pet stroller, and the other way around. 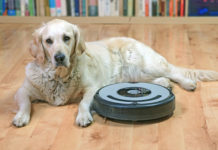 This is convenient for the loving dog owner who hopes to bring the dog along also when there won’t be a bike involved, like when taking a stroll through town or when going somewhere crowded. A feature which sets models apart are the weight capacities they come with. 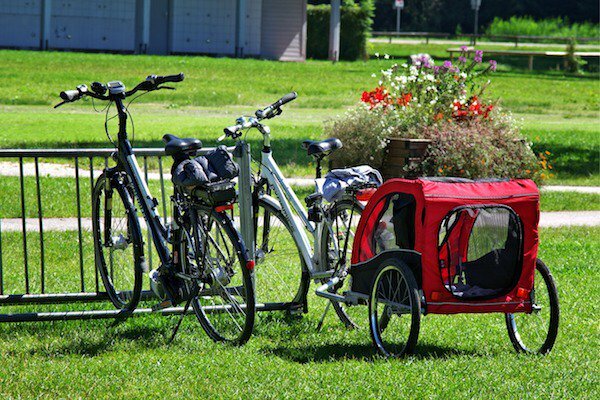 You can get a bike trailer for large dog friends, a small one for that tiny pouch, or one that fits your child and your pet dog – or two dogs – together! It is important to pay attention to this so that you do not end up getting a trailer unable to support the weight capacity of your dog, as that could end up being dangerous. When heading out for some bike trailer dog fun, especially if riding in trafficked areas, the last thing you want to deal with is a trailer that breaks because of a weight capacities issue. 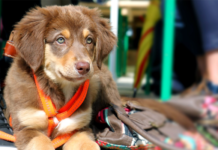 The 2-1 option is, as mentioned above, are ppet dog bike trailers that can be converted into something else, such as a pet stroller or an accessory for winter sports such as skiing. 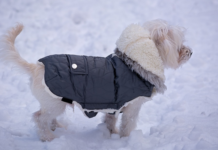 These are great for pet families that like to engage in different types of physical activities, as it means your dog can come along almost no matter where you go, and no matter what time of the year it is. Since these hybrid options are often a bit pricier, this pet bike carrier might not be worth it for those who strictly plan to use it for biking. A properly equipped pet trailer bicycle is an invaluable asset in itself for an out-and-about type dog owner, and for those wanting to take it a step further and find additional use for their dog trailer – a 2-1 option might be the way to go when choosing what model to buy. Once you start to look around, you will notice that there are several of these recommended dog bike carts that were really designed for children. So, the question is; is it better to get one made for kids or one especially aimed at dogs? The answer is quite simple. Yes, those made for children tend to be incredibly sturdy and reliable, but one especially made for dogs come with a variety of dog friendly attributes. They may have a back-or side door so that your pet dog can climb in easily, a build-in leash to attach to their harness for safety and plenty of windows so that they can lie down looking out. The question to ask yourself is whether you will also want a child to ride in the card on occasion? If so, pick one designed for children, as dog carts aren’t approved for human riders, in most cases. The pet bike carrier can always be adapted to properly fit your dog. If, on the other hand, you are entirely sure that no kids will ride behind you on your bike adventures – you might want to consider a specific dog cart to benefit from all its dog friendly features. A high-quality dog bicycle trailer tends to cost anywhere between $60 and $400, so the range in price is rather big. The recommendation is to pay more attention to the attributes of the pet dog trailer you are looking at, and to read reviews and opinions from real buyers. Expensive necessarily the best, and it all comes down to what you are looking for when transporting your dog. The first thing you need to look for is size. Is it big enough for your dog to fit comfortably? What is the weight limit? All products have specific measurements and weight capacities, which need to be abided to for the safety of both biker and dog. Also keep an eye out for removable flooring, as it makes the trailer so much easier to keep clean. Ask yourself what it is that you intend to use it for, and what you need for it to do, and make your decision based on that. Will you be transporting it by car? Pick one that collapses or folds up neatly. Will your child be riding in it? Pick one designed to safely transport children. Let your own needs guide you in your decision-making process. Dog bike trailers are sold in stores all over the world, but one of the best ways to get a good look at a wide selection of models is to go online and make both the decision and the purchase over the internet. Use encouraging methods like praise and canine training treats, to slowly get your dog used to riding in a bike trailer. It is like how you crate train a dog, and you need to make sure they feel comfortable enough to relax and sit or lie still during the ride. One thing you can do is to leave the trailer in the house, open for the dog to go inside and explore, before you take it out on the road. Never force your dog in there, as it could create a negative impression which will be very hard to get rid of. Think of a dog trailer as something that will allow you to spend more time with your dog, and to take your dog on longer and more challenging trips. Sit down, think of what you need for it to do and what your requirements are, and then dive into the diverse pool of dog bike trailers available. There is only so much a manufacturer can tell you about a product, so pay attention to reviews and what other buyers have thought of their purchase. You have a million options for what to do to keep yourself entertained, but your dog only has you. Any little thing you can do to involve him or her in more of your daily activities is likely to be life changing for your furry friend. After all, dogs can help your heart!